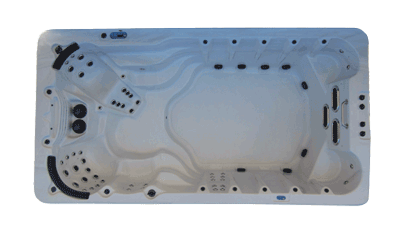 The Indulgence swim spa is the top of the line for us at Sunbelt Spas. It has the new River Jet swim system with Viper pumps, and plenty of water features. Four pumps give this piece of equipment a lot of water flow, for therapy and exercise. It features ten laminar water features and a spillover waterfall feature. It has a stand up therapy station with ten therapy jets, two swim out seats with two therapy jets in each, and three extremely therapeutic spa seats with 35 jets.